Author Wentworth M. Johnson has written and published more than twenty books in his prolific career, a remarkable feat that he accomplished after spending 12 years in the RAF, five years in a munitions factory and laboratory, and 28 years in television. His most popular books, the Bill Reyner Mystery Adventure Series, chronicle the adventures of amateur sleuthing trio: Bill Reyner, Newf, and Gran. 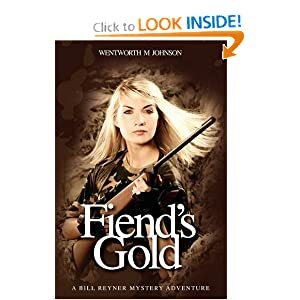 Readers were first introduced to Reyner in Fiend’s Gold. Since then, he has appeared in seven more novels: Mania, Edinburgh Cuckoos, Damp Graves, Lions and Christians, The Canadian, The Dutchman, and The Mermaid. The fast-paced series takes readers around the world, where stories of dangerous criminals, exotic treasure, and beautiful women unfold on the page. Johnson draws on his unique life experiences in writing his heart-racing tales. In the RAF, Johnson worked with the Ghurka regiment reclaiming Borneo after it had been invaded by Indonesia and, later, chasing pirates in the South China Sea as a navigator with the 1125th Marine Craft Unit. He has been shot at, shipwrecked, in a plane crash, been in a room with a wild leopard that tore the other person apart, and has been involved in many other dangerous scrapes and accidents throughout his life. In writing the Bill Reyner series, Johnson physically went to the locales to which Bill and company travel, lending to the detail and realism with which his stories are depicted. For anyone who loves action and sleuthing, Wentworth M. Johnson’s books are must-reads.